This article explores the economic incentives of dominant controlling shareholders with regard to the expropriation of minority shareholders, on the one hand, and the monitoring role of non-dominant large shareholders in family firms, on the other. The authors argue that family controlling shareholders (or family owners) do not share common interests with other shareholders. Drawing on 141 family firms in the manufacturing sector that were listed on Bursa Malaysia (the Malaysian stock exchange) from 2003 to 2006, the article finds an inverted U-shaped relationship between excess control rights and a firm's market performance. The findings also show that both the cash flow rights (i.e. claims on cash payouts) of family controlling shareholders and the presence of non-dominant large shareholders with the ability to contest control of the firm have a positive relationship with market performance. This study contributes to the literature by indicating that family owners are unlikely to collude with other large shareholders to expropriate minority shareholders. Furthermore, low levels of excess family-owner control rights are beneficial for market performance because firms may benefit from group affiliations and receive patronage from wealthy owners. However, high levels of excess control rights are understood to be an economic incentive for family owners to expropriate minority shareholders during non-crisis periods. Studies of corporate governance have clearly demonstrated that ownership structures in many emerging economies exhibit high levels of ownership concentration (Porta, Lopez-de-Silanes & Shleifer, 1999; Claessens & Fan, 2002; Steyn & Stainbank, 2013). In East Asia, wealth concentration is prevalent, and equity ownership is concentrated within families (Claessens & Fan, 2002). Consequently, there is limited demarcation between ownership and management in family firms. Minority shareholders may be expropriated when the interests of controlling shareholders do not align completely with those of minority shareholders (Jiang & Peng, 2011) in what agency theory calls principal-to-principal conflicts. Broadly speaking, two branches of the literature are relevant in analysing large shareholders in emerging economies. The first branch considers ownership concentration as the economic incentive for large shareholders to monitor and control firms. However, high ownership concentration may also lead to expropriations by controlling shareholders in emerging economies (Claessens, Simeon, Fan & Lang, 2002). Prior empirical studies have discovered conflicting evidence about the relationship between ownership concentration among multiple large shareholders and firm performance in emerging economies (e.g. Haniffa & Hudaib, 2006; Chen, Li & Shapiro, 2011; Choi, Park & Hong, 2012). Several studies have found a positive and significant relationship between ownership concentration among multiple large shareholders and firm performance (Claessens & Djankov, 1999; Haniffa & Hudaib, 2006; Driffield, Mahambare & Pal, 2007). However, other studies have shown that ownership concentration among multiple large shareholders is not significantly related to firm performance (Claessens, Djankov & Lang 2000; Choi, Park & Hong, 2012). Notably, the recent study by Chen et al. (2011) indicated a significant and inverted U-shaped relationship between ownership concentration (shareholdings owned by the ten largest shareholders) and firm performance in China. Chen et al. (2011) concluded that large shareholders-whether large shareholders were private or state shareholders-colluded to expropriate minority shareholders when ownership concentration was high. Thus, the conflicting and ambiguous empirical findings on ownership concentration in emerging countries demand more research attention. The second branch of the literature has focused on excess control rights of dominant controlling shareholders (or the largest shareholders) as the economic incentives to expropriate minority shareholders in emerging economies. Excess control rights can be defined as control rights in excess of cash flow rights (Driffield et al., 2007; Jiang & Peng, 2011). Several researchers have argued that excess control rights owned by dominant controlling shareholders were linked to poor firm performance during the East Asia financial crisis of 1997-1998 (Claessens et al., 1999a; Claessens et al., 1999b; Claessens et al., 2002; Lins, 2003), i.e. excess control rights are an economic incentive for dominant controlling shareholders to expropriate minority shareholders. However, Driffield et al. (2007) found that dominant controlling shareholders with excess control rights did not produce exclusively negative effects on firm performance when the study period was extended to the non-crisis period of 1994-1998 in East Asia. This conflicting empirical evidence has raised the question of whether the excess control rights of dominant controlling shareholders adversely affect firm performance during non-crisis periods. Thus, this article attempts to fill the research gaps regarding the ambiguous findings on the impact of ownership concentration among multiple large shareholders and excess control rights on firm performance during non-crisis periods. The article also addresses the call from Steyn and Stainbank (2013) to investigate the cost and benefits of firm control owned by dominant controlling shareholders in corporate governance. This study focuses on family firms to examine the economic incentives of family controlling shareholders in firm monitoring and management under the theory that family firms tend to prioritise firm control and family interests in business enterprises, and that family controlling shareholders are unlikely to share common interests with other large shareholders (Gomez-Mejia, Haynes, Nunez-Nickel, Jacobson, & Moyano-Fuentes, 2007; Tam & Tan, 2007). Additionally, the ultimate ownership concept was employed to examine the economic incentives of family controlling shareholders in corporate governance. The ultimate ownership concept posits that controlling shareholders can leverage cash flow rights to achieve greater firm control through pyramid or cross-holding structures (Porta et al., 1999). This study focuses on a single-country study because the emergence of organisation structure is heavily influenced by institutional context (Wielemaker & Gedajlovic, 2011). Malaysia is an excellent empirical context for investigating the economic incentive of controlling shareholders in expropriation of minority shareholders because of the prevalent firm control practice of using cross-sectional and pyramid structures. Corporate practitioners also perceived severe concerns about the expropriation of minority shareholders in Malaysia (Liew, 2007). The rest of the article is organised as follows: Section 2 reviews the relevant literature and formulates hypotheses. Section 3 discusses the datasets and research methods. The main results are presented in Section 4, and Section 5 concludes. In general, there is a high level of equity ownership concentration in Asian emerging markets (Claessens & Fan, 2002; Jiang & Peng, 2011). Additionally, ownership interests and firm management are frequently inter- twined, and this has led to the corporate governance research to focus on the economic incentives of dominant controlling shareholders (Claessens & Fan, 2002; Claessens et al., 2002). However, empirical studies in this line of research have revealed inconclusive evidence about the relationship between the ownership interests of dominant controlling shareholder and firm performance (e.g. Claessens & Djankov, 1999; Claessens et al., 1999a; Tam & Tan, 2007). On the one hand, Claessens et al. (1999a) and Claessens et al. (1999b) have indicated that the concentrated ownership by controlling shareholders is detrimental to firm performance in East Asian countries. On the other hand, Tam and Tan (2007) has offered evidence that firm performance is not affected by the concentrated ownership by dominant controlling shareholders in Malaysia. Perhaps the researchers should first determine the reasons why concentrated ownership by dominant controlling shareholders may not be beneficial to firm performance. In agency theory, economic utility is the main incentive for controlling shareholders to expropriate minority shareholders (Villalonga & Amit, 2006), which is also consistent with the argument that controlling shareholders may not necessarily share common interests with other investors (Shleifer & Vishny, 1997). Expropriating minority shareholders allows controlling shareholders to reap exclusive benefits while some proportion of the costs are borne by minority shareholders (Claessens & Fan, 2002). For example, the controlling shareholders who engage in a non-arms-length transaction with controlled firms would reap all the benefits, but would only be liable for a portion of the cash flow claims. To understand how concentrated ownership by controlling shareholders affects firm performance, Porta et al. (1999) conceptualises the term 'ultimate ownership' to evaluate the ownership of dominant controlling shareholders. As opposed to traditional approaches, ultimate ownership does not assume that shareholdings are equivalent to ownership. Instead, the ultimate ownership concept views voting rights as the ownership of the shareholder. This definition encompasses the scenario in which the shareholder has greater voting rights vis-á-vis cash flow rights (i.e. claims on cash payout). The use of 'ultimate ownership' can determine the real power of shareholdings and how dominant controlling shareholders maintain control over the firm via pyramid or cross-holding structures. Therefore, ultimate shareholdings might more clearly explain the incentives and entrenchment effects of controlling shareholders (Claessens et al., 2002). Excess control rights theory suggests that dominant controlling shareholders have an incentive to appropriate firm resources. Consistent with this argument, previous empirical studies have indicated that excess control rights wielded by controlling shareholders generally led to lower firm performance in emerging economies during the 1997-1998 East Asian Financial crisis (Claessens et al., 1999a; Claessens et al., 1999b; Claessens et al., 2002; Jiang & Peng, 2011). Previous research has also indicated that the market valuation of firm performance in emerging economies will be reduced when management increases its cash flow rights to achieve control over the firm because investors are aware of the potential managerial entrenchment that stems from misaligned incentives (Lins, 2003). The excess control rights owned by controlling shareholders threatens the confidence of minority investors because there is a general perception that controlling shareholders will expropriate minority shareholders particularly during crisis periods (Young, Peng, Ahlstrom, Bruton & Jiang, 2008). However, the excess control rights of controlling shareholders may not necessarily impose harmful effects on firm performance. Notably, excess control rights typically imply that the firm is affiliated with pyramidal business groups (Almeida & Wolfenzon, 2006) and thus with wealthy owners (Heugens et al., 2009). A group-affiliated firm may benefit from the economies of scale offered by large group-affiliated business in two ways (Carney, Gedajlovic, Heugens, Van Essen & Van Oosterhout, 2011). First, a group-affiliated firm can access the intangible resources of the entire business group for various ventures. For instance, the firm may leverage the 'family-based brand' in the family business group to enhance customer confidence in new products (Craig, Dibrell & Davis, 2008). Second, a group-affiliated firm is equipped with stronger business networks to internalise transaction costs in inefficient market environments because a high level of trust exists between the affiliated businesses (Peng & Zhou, 2005). A firm that is part of an affiliated group might also achieve higher profits through internal business transactions on top of regular business activities (Chang & Hong, 2000). Additionally, wealthy owners from business groups possess the ability to inject personal resources into firms for business venturing. The benefits of group-affiliated firms and concerns about incentives for expropriation induce the question of whether excess control rights are harmful or beneficial to firm performance. A related study on the effect of excess control rights on controlling shareholders in Indonesia, Korea, Malaysia and Thailand during the 1994-1998 period sheds some light on this controversial issue (Driffield et al., 2007). The Driffield study indicated that there was a non-monotonic relationship between the excess control rights of dominant controlling shareholders and firm performance. In that particular study, two dummy variables were used to represent the level of excess control rights simultaneously: (i) a dummy variable that assumed the value of '1' if voting rights exceeded cash flow rights, and (ii) a dummy variable that assumed the value '1' if excess control rights exceeded the median level of excess control rights in the samples. Specifically, Driffield et al. (2007) found that a low level of excess control rights was positive to firm performance, but a high level of excess control rights was detrimental to firm performance. H1: There is an inverse U-shaped relationship between excess control rights and firm performance during non-crisis periods. As described in the previous discussion leading to Hypothesis 1, the separation of cash flow and control rights (or excess control rights) leads to concerns about expropriation and to the conclusion that the concentrated cash flow rights provide an economic incentive for dominant controlling shareholders to engage in firm monitoring and management. Burkart, Gromb & Panunzi (1997) indicated that large ownership stakes have an immediate impact on shareholders' decisions to monitor and control firms when there are no deviations of cash flow and control rights. A shareholder will evaluate potential gain against potential loss when engaging in firm monitoring and control based on owned portion of shares. Thus, the economic incentive of cash flow rights is the prime motivation for dominant controlling shareholders to engage in firm monitoring and management. H2. The cash flow rights of family controlling shareholders are positively related to firm performance. Two related bodies of research address the role of multiple large shareholders in the ownership structure. The first body of research focuses on the impact of multiple large shareholders on alleviating concerns about expropriation by the dominant controlling shareholder (Bennedsen & Wolfenzon, 2000; Bloch & Hege, 2001; Su, Xu & Phan, 2008). Bennedsen and Wolfenzon (2000) developed a hypothetical model to examine how large shareholders could form a coalition to share control of the firm. The model demonstrates that the presence of multiple large shareholders with sufficient cash flow stakes may be effective in inducing mutual monitoring and limiting the consumption of private benefits. Additionally, Bloch and Hege (2001) proposed a competition model that indicates the presence of two large shareholders in the firms might shift the attention of the large shareholders in order to compete for corporate control instead of extracting private benefits. The rationale is that each large shareholder is willing to sacrifice private benefits to gain support from the minority shareholders. Therefore, large shareholders resort to submitting corporate proposals that are favoured by minority shareholders. The proposed model is also manifested in actual competition for corporate control in Malaysia. For example, Khoo (2013) reported that dominant controlling shareholder from Bright Packaging Industry Berhad in Malaysia resorted to proposing a 100 per cent dividend payout policy to gain support from minority shareholders and to prevent a takeover by a coalition of non-dominant large shareholders. Su et al. (2008) also provided evidence that the largest shareholders require a high level of voting power concentration to gain control of a board of directors and extract private rents in China, which implies that dominant controlling shareholders are likely to lose the exclusive control with the presence of non-dominant large shareholders. The evidence given is also consistent with the argument that principal-to-principal conflicts are largely dependent on whether controlling shareholders have strong controlling power in corporate control (Shleifer & Vishny, 1997). The second body of research focuses on whether and how multiple large shareholders collude to expropriate minority shareholders (Zwiebel, 1995; Bennedsen & Wolfenzon, 2000; Gomes & Novaes, 2005). Notably, an empirical study by Chen et al. (2011) found that the ownership concentration of the ten largest shareholders exhibits an inverted U-shaped relationship with firm performance in China. Whilst the study by Chen et al. (2011) seems to provide support for second body of research, it is unlikely to be applicable to family firms for several reasons. To illustrate, Zwiebel (1995) proposed a model that indicated that the presence of multiple large shareholders in the ownership structure makes the shareholders susceptible to colluding to extract and share the control benefits of the firm. The underpinning assumption is that the benefits of control are divisible among large shareholders. However, this assumption may not be practical because the types of controlling shareholders may also affect the objectives behind gaining firm control. Specifically, family controlling shareholders tend to prioritise firm control and family interests in business enterprises, associated with strong emotional components and prioritise the family welfare in firm decision-making (Gomez-Mejia et al., 2007). Likewise, Bennedsen and Wolfenzon (2000) developed a model to elucidate that the large shareholders with the greatest excess control rights may form a coalition to seize control of the firm. Subsequently, controlling shareholders may expropriate non-controlling shareholders. This scenario, however, is unlikely to occur in practice because no empirical evidence has indicated large shareholders in emerging economies have low concentrations of cash flow rights. Additionally, the empirical studies indicate that activism by large shareholders such as institutional investors can improve firm performance (Le, Walters & Kroll, 2006; King & Wen, 2011). Furthermore, some institutional investors with short-term investment horizon may be reluctant to engage in firm monitoring and may prefer to liquidate shares when the firm's prospects deteriorate (Le et al., 2006; Rasli, Goh & Khan, 2013). Similarly, Gomes and Novaes (2005) developed a theoretical model that indicates multiple large shareholders may share control and collude to share the private rents extracted from firm's resources. Gomes and Novaes (2005) also indicated that more balanced control between large shareholders can increase the minority shareholder protection in economies with weak legal institutions. The main rationale is that controlling shareholders are exposed to greater incentives to extract private rents in a weak legal environment. Thus, the control contestability exercised by non-dominant large shareholders can be effective to monitor dominant controlling shareholders in emerging economies. H3. The level of control contestability exercised by a large shareholder (or a coalition of large shareholders) with respect to family controlling shareholders is positively related to firm performance. The 'Industrial Products' sector index on Bursa Malaysia (the Malaysian stock exchange) was the sample selection used to identify the manufacturing firms. Subsequently, family firms were identified as those in which the ultimate family owners own at least 10 per cent of the voting rights and appear to be the largest shareholder in the firms (Porta et al., 1999; Claessens et al., 2002). The data were collected using annual reports, company announcements database, and Datastream. The reliability and comprehensiveness of data is covered because Bursa Malaysia requires firms to report ownership and family relations (including substantial shareholders and directors) in annual reports. Additionally, this research tracks ultimate ownership by using the disclosed ownership information in annual reports and 'change in shareholdings' in company announcements databases available through Bursa Malaysia. The market equity prices and financial information of the firms are obtained via Datastream. This study selects 2003-2006, which is a stable economic phase of the Malaysian economy, as the sample period to investigate economic incentives of family controlling shareholders. The 2007-2009 financial crisis periods which had adversely affected Malaysian economy are avoided (Gomez, 2012). Additionally, temporal changes of ownership structure may occur after the Malaysian government had reduced the quota for Bumiputera equity requirement for newly listed companies from 30 per cent to 12.5 per cent in 2009 (Gomez, 2012). The final dataset covering 141 family firms over a four-year period leads to 564 firm-year observations. The Partial Least Squares-Structural Equation Modelling (PLS-SEM) method is used to test the proposed theoretical hypotheses in this study. Structural Equation Modelling (SEM) was employed because the governance variables can be measured by more than one observed variable (Johnson & Greening, 1999; Lin, 2005; Azim, 2012). PLS-SEM, a non-parametric SEM approach, is more appropriate compared to covariance-based SEM because PLS-SEM allows the modelling of non-linear relations (Rigdon, Ringle, & Sarstedt, 2010). This study adopted the SmartPLS 2.0 (Ringle, Wende & Will, 2005) with path weighting scheme to test the hypotheses. 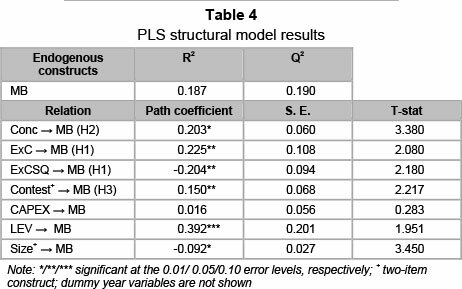 In reporting the PLS-SEM results, a two-step approach, was followed to assess the measurement models and the structural model (Chin, 2010). This study employed PLS-SEM, which is a construct-oriented approach, in model estimations. A single-item measure was used when no latent variables were available (Li, Lam, Qian & Fang, 2006). The single-item measure has been used in prior corporate governance studies that utilised structural equation modelling (Li et al., 2006; Tam & Tan, 2007; Azim, 2012; Berthelot, Francoeur & Labelle, 2012). Additionally, the single-item construct (or concrete construct) is appropriate in structural equation modelling when only one attribute is represented (Diamantopoulos, Arstedt, Fuchs, Wilczynski & Kaiser, 2012). Endogenous construct. The endogenous construct used is firm performance. The firm performance construct was the market-to-book ratio, in which firm performance is the ratio of the market value of common stock and book value of preferred shares and debt to the book value of total assets. Market-based firm performance (i.e. market-to-book ratio) is the appropriate measure in emerging markets because market investors would perceive it as a discount in the fair value of shares due to principal-to-principal conflicts in the ownership structure (Claessens et al., 2002; Young et al.. 2008). Predictor constructs. The economic incentives for family controlling shareholders are examined by cash flow rights and excess control rights whereas monitoring of non-dominant large shareholders is represented by control contest-ability. The cash flow rights represented the cash flow rights of the family controlling shareholders who are also the largest shareholders in the ownership structure (Claessens et al, 2002; Laeven & Levine, 2008; Attig, El Ghoul & Guedhami, 2009). The main contention of this study is that cash flow rights is the appropriate measure of economic incentive for family owners in firm management and monitoring. Excess control rights were calculated as the difference between voting rights and cash flow rights held by the family controlling shareholders (Claessens et al., 2002; Laeven & Levine, 2008; Attig et al, 2009; Jiang & Peng, 2011). The excess control rights represent the ultimate owners' utilisation of cross-sectional or pyramid structures to manipulate share- holdings and achieve greater control over the firm. The square of excess control rights was also included because of the inverted U-shaped relationship proposed in the hypothesis HI. 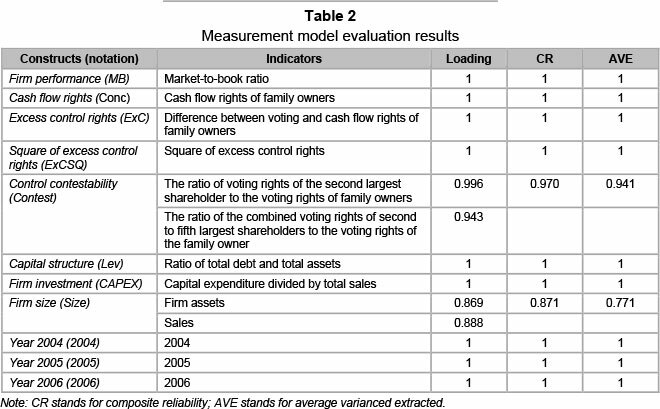 Control contestability was measured by two items: (i) the ratio of the voting rights of the second largest shareholder to the voting rights of the family controlling shareholders and (ii) the ratio of the combined voting rights of the second to the fifth largest shareholders to the voting rights of family controlling shareholders (Attig et al, 2009). The purpose of control contestability is to reflect the balance of power between family controlling shareholders and non-dominant large shareholders in the ownership structure. Controls. This study controls firm investment, capital structure, firm size and year in the proposed theoretical model. Firm investment represented the capital intensity, i.e. capital expenditure divided by total sales (Haniffa & Hudaib, 2006). Capital structure was the ratio of total debt to total assets (Haniffa & Hudaib, 2006). Firm size was measured by two items: (i) the book value of firm assets and (ii) firm sales. Three dummy year variables 2004-2006 are included to control year fixed effect (Chen et al., 2011) whereas year 2003 is omitted as the reference year. The research model for all hypothetical relationships in this study is shown in Figure 1. Table 1 presents the descriptive statistics for key constructs. The average cash flow rights owned by family controlling shareholders are 36.85 per cent whereas on average, excess control rights are 1.27 per cent. Notably, the average control contestabiltiy exercised by non-dominant large shareholders is approxi- mately 53.3 per cent, which implies that family controlling shareholders have strong controlling positions in most firms. With respect to firm-level characteristics, family firms have conservative business strategies (capital structures with an average leverage ratio of 26.3 per cent) and low firm investment (with average capital expenditures only accounting for approximately 8.9 per cent of total sales). The measurement models of reflective constructs were assessed based on indicator reliability, internal consistency reliability, convergent validity and discriminant validity (see Tables 2 and 3) (Hair, Ringle & Sarstedt, 2011). The results demonstrate that all indicator loadings are 0.869 or higher, which is above the minimum stipulated value of 0.70 and supports the indicator reliability in all reflective constructs (Hair et al., 2011). Likewise, all composite reliability values are above the minimum stipulated value of 0.7, and internal consistency reliability is achieved. Additionally, convergent validity is achieved because average variable extracted (AVE) is greater than the minimum stipulated value of 0.50 (Hair et al., 2011). With respect to discriminant validity, the square roots of the AVEs are higher than all inter-construct correlations (see Table 3), which provides support for discriminant validity based on the Fornell-Larcker criterion (Hair et al., 2011). To estimate the statistical significance level of the path coefficients in the structural model, the standard bootstrapping procedure (564 cases and 5000 samples) with the no sign changes option was performed. Notably, the validity of the structural model is verified via predictive relevance (Hair et al., 2011). The endogenous constructs must achieve predictive relevance with the minimum threshold value of zero to indicate that the model can adequately predict the indicators of endogenous constructs. Following the guideline proposed by Hair et al. (2011), the blindfolding procedure was used to obtain the Q-square for the predictive relevance. Table 4 summarises the estimation results of the structural model. The Q-squared in Table 4 is 0.19 and above zero, which supports the validity of the structural model. 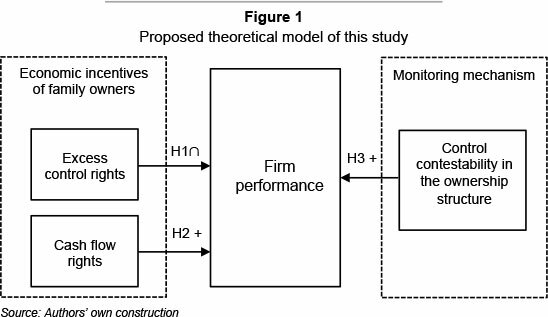 Consistent with H1, the results suggest that excess control rights exhibit an inverted U-shaped relationship with firm performance. In effect, the excess control rights and square of excess control rights demonstrate a statistically significant relationship with firm performance (p < 0.05). However, the excess control rights have a positive path coefficient, whereas square of excess control rights have a negative path coefficient. These results support the contention in this study that excess control rights imply that the family firms are group-affiliated firms and (or) associated with wealthy owners. Thus, these firms can access various resources through affiliated business networks to increase market competitiveness and, in turn, to achieve higher firm performance. However, the high level of excess control rights provides significant economic incentive for family controlling shareholders to appropriate firm assets for own private benefit and negatively impact firm performance. Consistent with H2's prediction that the cash flow rights of family controlling shareholders influence firm performance, the results show a positive and statistically significant relationship (p < 0.01) between cash flow rights and firm performance. The results affirmed the contention in this study that cash flow rights, not control rights, are the economic incentive for family controlling shareholders to engage in firm monitoring and management. The cash flow rights of dominant controlling shareholders are particularly relevant in the ownership context in emerging markets which dominant controlling shareholders use cross-sectional and pyramid structures to control firms. Since control contestability was found to be positively related to firm performance (p < 0.05), H3 is supported. It could be concluded that control contestability exercised by non-dominant large shareholders can monitor family controlling shareholders effectively. These findings can be supported through prior empirical evidence that shows that the main objectives of family owners are protecting family interests and control in family firms (Gomez-Mejia et al., 2007; Tam & Tan, 2007; Gomez-Mejia et al., 2010). That is, family owners, i.e. owners who prioritise the transgenerational control, are unlikely to collude with other large shareholders to harm the family reputation and the long-term prosperity of the firms. Additionally, the findings reject the view that excessive monitoring may hinder manager initiative to make profitable investments in technology-based firms (Grosfeld, 2009), which might be explained by the possibility that the overlap between family shareholdings and management shifts the firm objectives to protect family interests. The control variables show certain notable findings (see Table 4). The results suggest that firm investment has a non-significant relationship with firm performance, but firm size has a negative and statistically significant relationship with firm performance (p < 0.01). It could be that firm investment in family firms may focus on lowering the risk of investment and forgo profitable business investments in safeguarding family security (Tam & Tan, 2007; Gomez-Mejia et al., 2010). This study also finds that firm leverage shows a positive, albeit mildly significant relationship with firm performance (p < 0.10), which can be attributed to proper use of debt and increasing shareholder return. The purpose of this article was to examine the economic incentives of family controlling shareholders and the monitoring role of non-dominant large shareholders in family firms. The results suggest that the excess control rights owned by family controlling shareholders are not necessarily detrimental to firm performance because the firms can access more resources in wider business networks (the family business group) and (or) receive patronage from wealthy owners during non-crisis periods. However, high levels of excess control rights translate into greater economic incentives for family controlling shareholders to expropriate the minority shareholders, which, in turn, harms firm performance. This phenomenon can be observed through an inverted U-shaped relationship between excess control rights and firm performance. The findings warrant future research attention because the excess control rights imply that the family firm is a group-affiliated firm or associated with wealthy owners. Moreover, this study finds that the cash flow rights of family controlling shareholders exhibit a positive relationship with firm performance. This outcome suggests that cash flow rights represent the economic incentive for family controlling shareholders to monitor and control firms. The study also finds that the balance of voting power distributions between family controlling shareholders and non-dominant large shareholders can be effective in monitoring family controlling shareholders. Stated differently, the second largest shareholder and coalitions of non-dominant large shareholders can play a monitoring role in family firms. Thus, the study provides new evidence that large shareholders do not exhibit same behaviour in corporate governance or expropriating minority shareholders in family firms. The findings also lend support to the family business research in which a family controlling shareholder is a distinct economic entity that prioritises family interests (Gomez-Mejia et al., 2007). This study rejects the view that multiple large shareholders, including private shareholders, will collude to expropriate minority shareholders (Chen et al., 2011). Specifically, family controlling shareholders are unlikely to collude with other non-dominant large shareholders to expropriate minority shareholders. There are two limitations in the article. The study is based on a sample of 141 family firms in the Malaysian manufacturing sector, and the generalisability may be most relevant to the technology-based sectors. The rationale for this is that the different activities of industries may limit the function of ownership structures in corporate governance. Additionally, the study mainly focused on the publicly traded family firms in Malaysia. Consequently, the generalisation the findings beyond publicly traded family firms may be limited because privately held firms are usually smaller and not bound to stringent corporate governance regulations. Further research may be extended to study whether control contestability exercised by non-dominant large shareholders could be an effective monitoring mechanism in privately held family firms. Extending this research by comparing with other advanced and emerging economies remains another avenue for further research. The authors thank the anonymous reviewers for their constructive comments and suggestions. Any errors remaining are the full responsibility of the authors. BLOCH, F. & HEGE, U. 2001, Multiple shareholders and control contests. Working Paper, France, Aix-Marseille Université [ Links ].